बटाट्याची चाळ अजून उभीच आहे. ऊन खात, पाऊस पचवीत, समोरच्या नवीननवीन इमारतींना तोंड देत उभी आहे. खिडक्यांचे आणि कठड्यांचे लाकडी गज अर्ध्यांहून अधिक उडालेले आहेत. जिने आपली पायरीसोडून वागायला लागले आहेत. भल्याभल्यांचे पाय येथे घसरू लागले आहेत. भिंतींचे पोपडे उडाले आहेत. रंग तर कित्येक वर्षांपूर्वीच उडाला. खूप वर्षं झाली त्याला. आज जो रंग भिंतींना दिसतो ती छटा कुठल्या डब्यातून येणार्‍या रंगाची नाही. हा अनेक वर्षं अनेकांनी पुसलेल्या बोटांतून, टेकलेल्या डोक्यांतून, धुरांतून तयार झालेला रंग आहे. त्या बटाट्याच्या चाळीच्या या गमतीजमती! mast maja aali pustak vachun. man prafullit zhal. I like the book very much. I want to read online from this website.how to do this.pl.tell me. Batatyachi chaal. 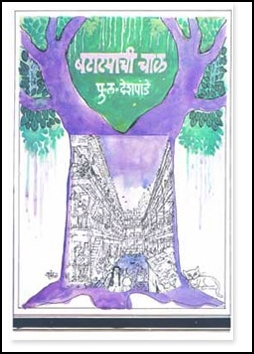 ...... one of the finest books ever written in marathi.. this book is a mixture of comedy,sentiments, bonding , and lots more .one can actually feel it while reading. A must book to read by every one. batatyachi chal he story khupach chan aahe. lekhakance khupach aabhar . BEST "BATATYACHI CHAL" MARATHI BOOK KHUPCH SUDAR V APRATIM AAHE SO NAICE . I LIKE THIS BOOK. Mastt book ahe. mala punha ekda vachaychay. soft copy pathva. plzzzzz.. This book is very nice. I am really thankfull to you for this wonderfull book. What the hell is this language? india madhe doller thakre la bolau ka? dollers kay site bandh karel mumbai bandh srkhi. I AM A MARATHI BOY. AND HAVE THIS BOOK . BUT I HAVE ONE QUESTION TO YOU TO WHICH PRICE IS THIS AND PLZ SAY IT ON INDIAN MAONEY NOT FOR US MONEY .AND I THINK THAT THIS WEB-SITE IS INDIAN SO WHY U WRITE THIS PRICEIN US MONEY.SO I CAN REQUEST U TO PLZ WRITE THIS PRICE IN INDIAN RUPPE. pls tell me if any site is there for i can read this book on line from there.
" In Marathi there is no best book than the BATATYACHI CHAL IT'S FOREVER BOOK FOR ALL AGE PEOPLE."